TIBCO Spotfire® is a data visualization tool popular among life science researchers and financial organizations who require simple-to-build dashboards. 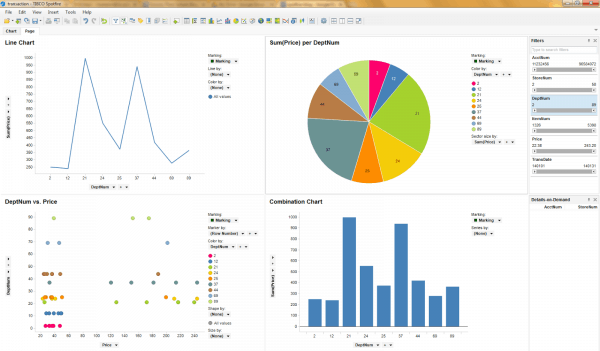 Spotfire features in-memory data processing and sophisticated predictive analytics. However, like most business intelligence tools, it is not designed for big data integration and pre-visualization processing. The SortCL program in the IRI CoSort product or IRI Voracity platform is a fast, simple, and inexpensive way to prepare big data for Spotfire efficiently -- both in terms of job design and runtime performance. See this section to understand why. In a late 2014 benchmark with only 20M records on an average PC, CoSort prepared the same data results for the Spotfire visualization above four times faster than Spotfire could, for details click here.